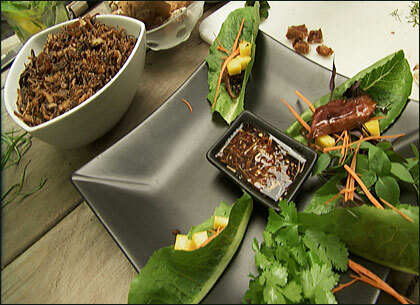 Asian-inspired grilled duck served with a spicy dipping sauce. Place the duck breasts in the marinade. Grill the duck breasts on the barbeque. Arrange the 6 lettuce cups on 6 plates. Divide the herbs and shallot mixture onto each lettuce cup. Divide the dipping sauce into a bowl on each plate. Thinly slice the duck breast and divide slices into each cup and serve immediately. This segment appears in show #3301.